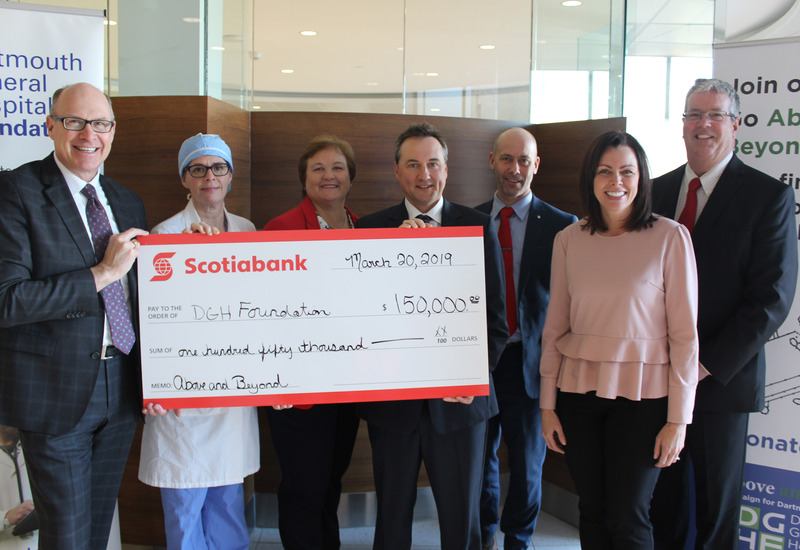 DARTMOUTH, NS (March 20, 2019) – In the Dartmouth General Hospital’s new lobby today, the Dartmouth General Hospital Foundation announced a generous pledge of $150,000 from Scotiabank towards the $13M Above and Beyond Capital Campaign. Scotiabank expressed particular pride in what their gift will mean for patients and for employees. Their pledge will help fund the latest tools and technology that will improve patient safety and enhance quality of care when it comes to diagnosis and treatment. Scotiabank’s generous gift will be recognized by dedicating one of the new Multi-Purpose Operating Theatres in support of advanced operating room technology. The eight new operating theatres in the hospital’s new Surgical Centre and Endoscopy Clinic will be designed with advanced technologies for better clinical outcomes. The addition of these new technologies will mean an overall more productive process, from admittance to treatment. The advanced equipment will allow Dartmouth General Hospital healthcare professionals to improve the way our patients receive care, more quickly and efficiently, which will help with patient throughput. This in turn will help with major concerns, such as wait time for orthopedic and endoscopic procedures. It will help with inpatient capacity as well, with leading edge technology reducing risks and complication rates meaning shorter stays. It will also allow for more outpatient procedures, specifically procedures like colonoscopies. Thank you Scotiabank, your gift will impact the lives of many.